Malaysia covers an area of about 329,758 sq. km, consisting of 11 states in Peninsular Malaysia, 2 states in the island of Borneo (Sabah and Sarawak) and 3 Federal Territories. Peninsular Malaysia, covering 131,598 sq. km. has its frontier with Thailand and Singapore while the states in Borneo covering 198,160 sq. km. borders the territory of Indonesia’s Kalimantan to the South and Brunei to the North. Malaysia lies close to the equator between latitudes 1°and 7° North and Longitudes 100° and 119° East. The population is approximately 30.4 million, with a growth rate of about 1.8%. Malaysia is a multi-racial country and the majority of the population resides along the west coast of Peninsular Malaysia. In Peninsular Malaysia, the States of Perak, Selangor, Pahang and Negeri Sembilan formed themselves into a loose federation known as the Federated Malay States (FMS), with a system of centralized government. These four states, together with the states of Kedah, Perlis, Kelantan, Terengganu and Johor, had an administration link with the British Straits Settlements of Penang, Malacca and Singapore, through the High Commissioner for the FMS being also the Governor of the Straits Settlements. Following the end of World War II and the period of British military administration, Malacca and Penang were joined to the nine Malay states to form in 1946, the Malayan Union; this being superseded by the Federation of Malaya, in 1948. The Federation of Malaya became an independent country, with a constitutional monarchy, on 31st August 1957. On 16th September 1963, Malaysia became a federation comprising the 11 states, as abovementioned, and the states of Singapore, Sarawak and North Borneo, (now known as Sabah). Singapore left Malaysia in August 1965, thus leaving 13 states, of which Sarawak and Sabah are jointly known as East Malaysia, and the remaining 11 states are commonly referred to as Peninsular Malaysia. Malaysia’s government is modelled after the British system, somewhat modified because Malaysia’s federal structure incorporates 13 states and 3 federal territories. Nine of those states have rulers or sultans and they elect a monarch, the supreme ruler, every five years. The government is based on a parliamentary system, headed by an elected Prime Minister. The Parliament consists of a partially appointed senate and a house of representatives whose members are elected by universal adult suffrage. The Federal Government has powers such as over external affairs, defence, internal security, civil and criminal law, federal citizenship and naturalization, finance, trade, commerce and industry, taxation, customs and excise duties, shipping, navigation and fisheries, communications and transport, federal works and power, education, medicine and health, social security and tourism. The States’ powers include over land and its administration, Islamic law, Malay customs, permits and licenses for mines prospecting, agriculture, forests, local government, states works and water, and riverine fishing. The Torrens system, introduced between the years 1879 and 1890 in FMS, was based substantially on the Torrens legislation of South Australia and Fiji. Through succeeding political changes in the country, it finds present statutory expression in the National Land Code, 1965 (NLC) in Peninsular Malaysia, the Sabah Land Ordinance, in the state of Sabah and the Sarawak Land Code, in the state of Sarawak. The National Land Code (NLC) was enacted to establish a uniform land system to replace the existing systems. Prior to the passing of the NLC, two quite different systems of land tenure existed side by side. The former British Colonies of Penang and Malacca retain a system peculiar to the pre-war “Straits Settlements” (modelled on the English laws of property and conveyancing) whereby privately executed deeds are the basis of title to land while the remaining nine Malay States, by contrast, employ a system based on the principle that private rights in land can derive only from express grant by the State or secondarily from state registration of subsequent statutory dealings. Peninsular Malaysia is a federation of States, each of which is responsible for its own land matters. All States operate a Torrens system of registration, administered by the State Land Offices and coordinated by the Department of Land and Mines. On the other hand, cadastral survey isunder the purview of Jabatan Ukur dan Pemetaan Malaysia (JUPEM) which is a federal department. JUPEM is responsible for undertaking cadastral survey work within Peninsular Malaysia but is supported by a growing number of licensed land surveyors, whom are primarily responsible for engineering and subdivision surveys. Notwithstanding the above, the cadastre in the states of Sabah and Sarawak are administered by the Department of Land and Surveys (DLS). They have the ideal setup of having land administration and cadastral surveys under the control of a single organisation, which is a State entity. A substantial portion of cadastral surveys (roughly about 80%) are undertaken by the private land surveying firms. However, their work will have to be submitted to the Department of Survey and Mapping for checks and approval. With some exceptions, all of the engineering surveys are conducted by the private sector. Additionally, a major part of the task of creating the Digital Cadastral Database for the whole of Peninsular Malaysia, as well as some cadastral survey tasks assigned to DSMM has been outsourced to the said sector as well. The Royal Institution of Surveyors, Malaysia (RISM) is the main professional organisation representing the surveying profession in Malaysia, whereby memberships are open to those in both the government and private sectors. It consists of 4 main divisions, namely those of Geomatic and Land Surveying (GLS), Property Management and Valuation Surveying (PMVS), Quantity Surveying (QS) and Building Surveying (BS). Apart from that, the licensed land surveyors do have their own association, known as the Persatuan Jurukur Tanah Bertauliah (PEJUTA). To a certain extent, PEJUTA has obligations pertaining to the professionalism of licensed land surveyors and the improvement of the surveying services. Land surveyors (with the exception of those serving with JUPEM or DLS, in the case of Sabah and Sarawak) carrying out cadastral surveys are required by law to be licensed by the Lembaga Jurukur Tanah Malaysia (LJT), and in the case of Sabah – the Land Surveyors Board of Sabah and in the case of Sarawak – the Land Surveyors Board Sarawak. While it is not a legal requirement in the case of topographical and engineering surveys as yet, registration with the LJT is insisted upon by most clients and all government agencies. It is a statutory requirement that LJT keeps a register where prescribed particulars of all Land Surveyors admitted into the Register such as names, addresses, qualifications, etc. are noted. This Register is maintained and kept by the Secretary at the office of the LJT, and is open for inspection by any person on payment of a prescribed fee. A license to practice is issued annually to a surveyor whose name appears on the Register. Any LLS who has not renewed his license before the 1st February of each year will find his name removed from the Register. However, LJT may restore to the Register any name removed there from with the payment of registration and other fees. To obtain admission into the Register, one must be a citizen of good character, 21 or more years of age, has passed all professional and competency examinations, has the required period of practical training, is not under any disability, and has paid the required registration fee. Government surveyors, as long as they are employees of the Government, are not issued with licenses, but they can perform cadastral survey work required by the Government under the overall supervision of the Director General of Survey and Mapping. The professional surveyor is required to undergo and receive an effective and proper formal surveying education in a tertiary institution. Geomatic and Land Surveying degree programmes are offered at two universities, namely the University of Technology Malaysia (UTM), and University Institut Teknologi MARA (UiTM). At both universities, the Geomatic and Land Surveying degree programmes are designed in such a way that it blends academic requirements with the overall government policy on education and other requirements considered beneficial to the nation. About 100 graduated annually from both universities, with about 15 or so postgraduate students involved in surveying or related research areas. Currently, about 40% of students studying at undergraduate level are women. LJT accepts creditable Geomatic and Land Surveying degrees from local and overseas institutions / universities, subject to a detailed consideration of their syllabus, lecture times and practical training before any recognition is given. However, in the past quite a substantial number of land surveyors have entered the ranks of professional licensed land surveyors through the professional examinations route. The objective of the Malaysian cadastral system is to provide security and simplicity to all dealings with land. It establishes and certifies, under the authority of the Government, the ownership of an indefeasible title to land and simplifies, hastens and cheapens all land dealings. The title is conclusive proof that the person mentioned therein is the owner of the land described therein. Valid titles require an accurate description of boundaries and as such cadastral survey plays an important role in the system. The Malaysian cadastral system has essentially two basic components, which are the very pillars of the system’s reliability and credibility, i.e. the land registration and the cadastral survey components. The cadastral survey is under the jurisdiction of JUPEM for Peninsular Malaysia while the land registration is under the purview of the State Land Authority. For the state of Sabah and Sarawak, both of the land registration and cadastral survey are under the responsibility of the Sabah and Sarawak’s Department of Land and Survey. There are two basic components in the Malaysian cadastral system - the land registration and the cadastral survey components. The most important element in the land registration component is the type of title called for by the system of land tenure and the nature of Government guarantee. The system provides for registration to confer indefeasible title or interest, except in certain circumstances, such as through fraud or misrepresentation or registration obtained by forgery or by means of an insufficient or void instrument. Essentially, for alienation under final title, it only becomes effective from the time of the registration of the Register Documents of Title (RDT) at the Land Office or the Land Registry, whereby the Issue Document of Title (IDT) would be simultaneously issued to the registered proprietor of the land. Both the RDT and the IDT have affixed to them and appropriately sealed, a plan of the land, certified as correct by or on behalf of the State Director of Survey. The proprietor of any land enjoys the right of effecting dealings with respect to his land and the interest therein. Such dealing is effected by an instrument being registered into the documents of title. The instruments capable of being registered include any transfer of land, lease or sub-lease, charge, or surrender thereof. Effectively, the register is conclusive evidence that the person named in it as the proprietor of an interest in land is the legal owner of that interest. More importantly, the system compels that interests in land can only be varied or changed by registration. The Government having decided the nature of the land registration system and given statutory expression to it, it is then the business of the cadastral survey authority to decide the scope of the surveys and the standards of accuracy essential to the validity of the type of title called for by the law. The law specifies the manner in which surveys are to be carried out for the purpose of the issuance of a final title. It is only after this survey that other transactions such as subdivision, amalgamation, etc, of that parcel of land can be carried out. As mentioned, the law requires every parcel of land to be surveyed and demarcated on the ground prior to the issuance of final title. It provides for ‘fixed’ rather than ‘general’ boundaries. Parcel definition is by officially emplaced and mathematically coordinated boundary marks rather than by topographical details. The surveyor emplaces the boundary marks that demarcate the parcel and carries out a survey of these boundary marks based on the cadastral reference marks established by JUPEM in the GDM2000 reference frame. On the completion of the survey, a plan is generated and when approved by the Director of Survey becomes a certified plan. Title plans are then generated from the certified plans to be attached to the land title. One important aspect of the registration system is the peculiar practice of issuing temporary land titles, termed as qualified titles (QT). The purpose for this is to enable land alienated to be issued with title in advance of survey or prior to survey and in the broader context, to speed up land development. QT also enjoys the right of effecting dealings with respect to his land and the interest therein. However, the area is provisional until a final survey has been carried out and a final title registered. a) Textual aspect – the land register furnishes all necessary information, the basic ones being the name of the proprietor and the actual land alienated – through a description of its administrative area and lot number or land office number in the case of QT. Other information includes those on owner’s rights, encumbrances, express conditions, caveats and prohibitory orders, if any. However, not all imposed conditions and restrictions are stated in the register; there are some that are provided by law as implied conditions and have to be abided by the proprietor. b) Spatial aspect – the Malaysian cadastral parcel fabric can be conveniently obtained online via the JUPEM Geoportal. With the exception of land parcels that are held under QT (awaiting surveys and finalisation of boundaries) the map depict all land parcels (i.e. surveyed) together with their unique lot numbers or identifiers, as well as the certified plan numbers for ease of reference and search. Hard copy maps are now completely replaced with digital ones through a conversion exercise that ended in 2002. The cadastral parcel fabric provides other land related agencies in Malaysia information for planning and land development purposes. There are approximately 7.3 million land parcels in Peninsular Malaysia, of which about less than 0.5 million are still held under QT. With the implementation of the eKadaster project, surveyed parcels have been readjusted based on geocentric datum - GDM2000, which have been adopted in August 2003. The survey processes are now carried out completely in a digital environment and data kept within each State as part of the National Digital Cadastral Database (NDCDB). The field survey data observed and recorded digitally are verifiable online by the surveyor in the field, before lodging online for subsequent detail verification by JUPEM. Upon successful verification, the surveyed data will be appended into the NDCDB. Cadastral survey data in the form of certified plans, cadastral maps and vector maps are then generated from the NDCDB and are made available through JUPEM Geoportal. On the other hand, the Computerised Land Registration System (CLRS) was implemented in 1990 and currently access to title information can be made at the computer terminals of all Registry and Land Offices of the concerned States. However, all land dealings will have to be conducted at the appropriate office in which the land title was formerly registered. The information in the CLRS database is based on the records kept in the land registers and relevant files. These include information on ownership, land identification, restrictions and record of dealings. The system also produces various outputs amongst which are the RDT and IDT, search certificates and specific reports. Cadastral mapping is based on the geocentric Cassini-Solder Coordinate System and each State has its own origin and reference meridian resulting in a total of 9 different State coordinate systems. 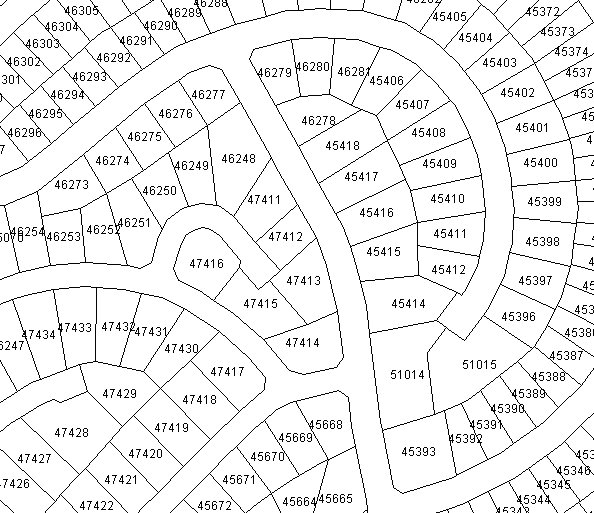 Cadastral maps are used primarily for identification of land parcels for land management. On these maps are plotted all lots that are surveyed by both government and licensed land surveyors. Prior to their conversion to digital form, the scales of these maps vary from 1 inch to 1 chain in urban areas, to 1 inch to 8 chains, in rural areas. All states currently have cadastral maps in digital form based on a graphical representation of geometric components, through the implementation of the eKadaster system, which was commissioned in 2010. Under the eKadaster system, the cadastral maps are generated on demand from the survey accurate NDCDB. Fig. 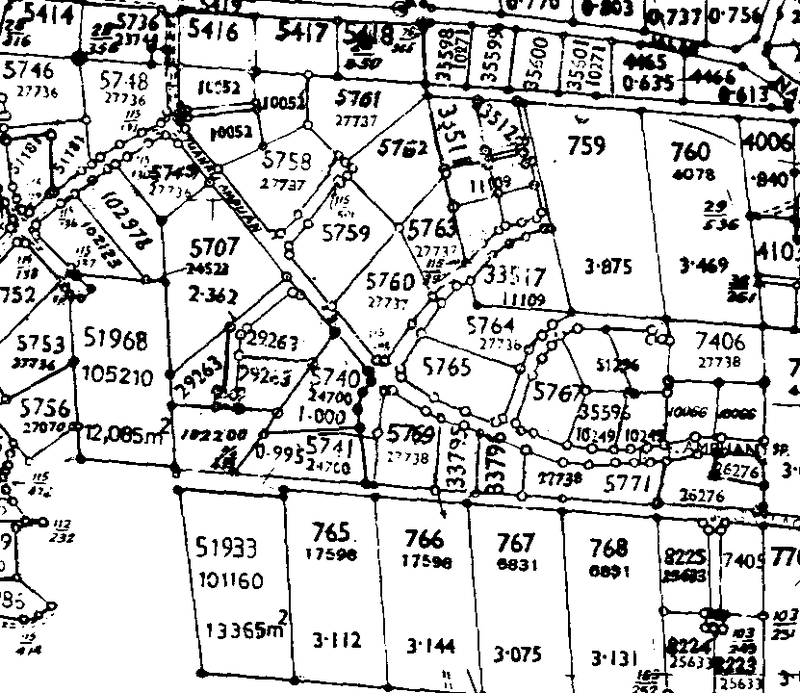 1: The Cadastral Map prior to eKadaster. Fig. 1 shows the conventional type of a cadastral map that is prepared in hard copy form – commonly referred to as standard sheet. It basically depicts the land parcel, parcel number, boundary marks, boundaries, parcel area (if unconstrained by space), number of the certified plan, road names, etc. Fig. 2 shows the current cadastral map generated from the survey accurate NDCDB. The Malaysia SDI (acronym MyGDI) was formally established in 1997 through a directive from the Secretary General of the Government. It is based on an open system platform of distributed databases, whereby data is kept in the databases of land related agencies and not in a centralised system. The information that can be made available to land information users under MyGDI consist of datasets obtained from the land related systems, or more specifically, the databases of agencies linked to MyGDI. They are essentially data that the agencies maintain in their systems for their business operations. Notably, of importance in the said arrangements is the acceptance of the base map as the basic building block for the MyGDI data model and that the cadastral layer is one of the main constituents of this base map. Malaysia has a rigorous cadastral system, which provides a secure basis for land and property ownership. However, it is not altogether flawless. One of the major drawbacks includes the incompatibility between cadastral and mapping data due to the use of different coordinate systems. The establishment of NDCDB which is based on different State Cassini-Soldner cannot be integrated with other spatial data such as topographic which is based on the RSO Projection. To overcome those deficiencies, studies have been carried out to implement coordinated cadastral system and among the outcome is the realization of the geocentric datum GDM2000 which allow mapping and cadastral data to be integrated using RSO projection in August, 2003. This issue goes hand in hand with the intention of having a continuous Certified plan (CP), which may eventually result in the termination of the use of the said document and the consequent need to give legal significance to the NDCDB. Under the latest amendment to the National Land Code, any databases adopted by the Department of Surveying and Mapping Malaysia will be given legal significance since such databases are used in the title survey. The image database adopted but the Department to assist field surveyor were still be maintained to provide evident should the need arise. The adoption of a continuous CP seems favourable over the long term and the adoption of NDCDB will hasten the pace. However, it appears that currency, quality and integrity of data need continuous refinement to ensure completeness of NDCDB. The absence of QT information in the NDCDB is the biggest hurdle in creating a complete and up-to-date NDCDB for the whole country. Such information is either in graphic form from State Land Office or digital form of pre-comp plans from licensed land surveyors. The challenge is to overcome the estimated 0.5 million land parcels where the conversion of QT to Final Titles (FT) is yet to be carried out. An inspectorate team has been set up to ensure the quality of surveying work carried out by Licensed Land Surveyors and JUPEM’s surveyors. Completed survey files are randomly selected for further field investigation. Any blunders committed by the respective Licensed Land Surveyors shall be reported to LJT for further diciplinary actions. Realising the importance of NDCDB, continuous effort shall be taken to enhance the quality of its accuracy by densifying the cadastral reference marks through out the nation. Additional cadastral reference marks are added at salient locations to further strengthen the cadastral survey network. The importance of the NDCDB has been recognized by Malaysian Centre for Geospatial Data Infrastructure (MaCGDI) as an important fundamental dataset for any geospatial applications including national spatial planning. In this regards efforts are underway to capture other data which include building footprints, 3D property objects, administrative boundaries as well as road and street addresses to support multipurpose cadastre. There could evidently be extensive benefits if the eKadaster of JUPEM and the Computerised Land Registration System (CLRS) of Land Office are linked together. eTanah (eLand) system of State Land Office that replaced the CLRS system for the state of Penang, Malacca and Negeri Sembilan and have integration with eKadaster. With the integration of spatial data from eKadaster and attribute data from eTanah and through identified applications, efficiency of land administration have been greatly improved. The integration includes data exchange format, data transmission mechanism, and data sharing. The other states that have yet to implement eTanah have been given access to JUPEM2U (JUPEM’s eKadaster working portal) to upload and download related spatial and non-spatial information. To complement the initiatives of JUPEM, LJT has also initiated several programmes of its own, which are aimed at providing the impetus for licensed land surveyors to modernise and increase the cost-effectiveness of their own operations. LJT has introduced eLJT that enables licensed land surveyors to operate online in all aspects of their operations which includes depositing and reimbursement of survey fees. eLJT also provides data integration with the eKadaster system to facilitate survey file registration, verification of job submission and completion for the purpose of job monitoring and management.